I've been thinking about writing this post for about a year now. I even once tried filming a booktube video about the topic but I couldn't get the voice over quite right. I think the way that I blog is probably different to everybody else because we all have our own ways to organise and motivate ourselves. And I thought today I might share with you some of the ways in which I blog because someone else might find it interesting? For me, blogging is all about organisation. I've heard lots of people say they use phone apps and Google Calendar and things like that to organise their blogging ideas and blog posts. I'm old-school. I carry around with me an ever-changing blogging notebook in which I fill with blog post ideas, interview questions, to-do lists and monthly schedules. I really couldn't function as a blogger without my notebook. Not only do I write down ideas for blog post topics and future features and that sort of thing, I also use it to keep track of blog tours I'm taking part in, what reviews I haven't yet written etc. What I like to do is draw out an upcoming month, like this one I just scribbled out for April. 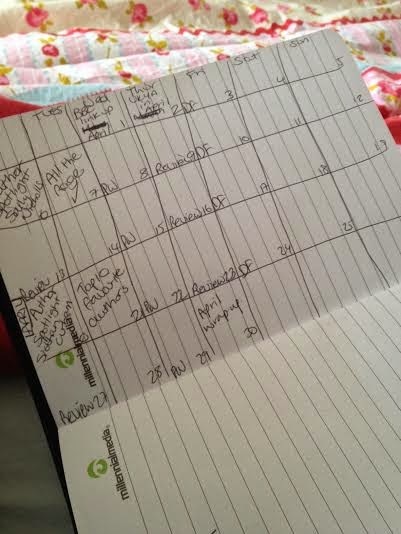 A monthly schedule is perfect for me because I can write blog posts in advance and slot them where they fit in. I also prefer a monthly schedule so that I can get a better perspective of the different types of blog posts that will appear on this blog on a monthly basis. I don't like things to be too samey all the time. I usually have set monthly posts that go up at the same times every month. The 1st is always reserved for the British Books Challenge Link Up, the 2nd always features the UKYA that is being published every month. The last day of the month is always reserved for my monthly wrap-up. Next I look at the memes that I take part in. I dip in and out of Top Ten Tuesday and if a topic takes my fancy I'll plan that into the schedule. I've always started doing my own Author Spotlights which I do twice a month on a Monday. I usually pick authors who have books published that month. 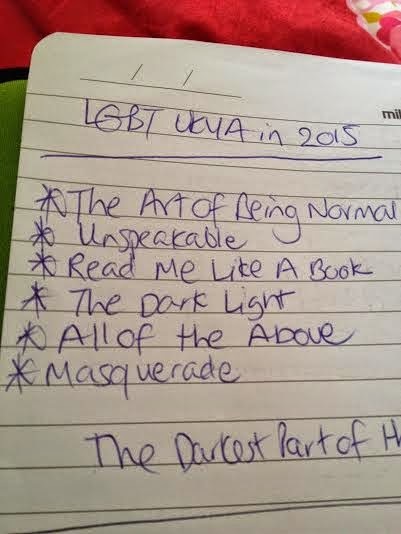 You can see I've already chosen April's authors so that I can plan ahead. Mondays, Tuesdays and Thursdays (when not taking part in Top Ten Tuesday or Author Spotlight) are set aside for reviews. Next to Wednesday, I've written 'PW' and on Fridays I've writen 'DF' These acronyms stand for 'Personal Wednesdays' and 'Discussion Fridays' which means that I attempt to write one bookish post a week that is not a review and one more 'personal' post that is not about books. It's important for me to do different types of posts twice a week. I get bored reading only reviews and you must too? Weekends are currently free but these are also the days I generally set aside for my own features. Until those features are in place I use them as free days. Can post anything on those days or nothing at all. Either is great. Here's where I think it gets more interesting. Writing the blog posts. I've had a few people ask me recently how I manage to juggle the many different things going on in my life. Blogging and reading and raising my boys and my university courses etc. And I really think it's down to the way I organise my time. Let's use a specific blog post as an example. If you look at my April blogging calendar, you'll see that there is one Top Ten Tuesday post that I'm aiming to write. 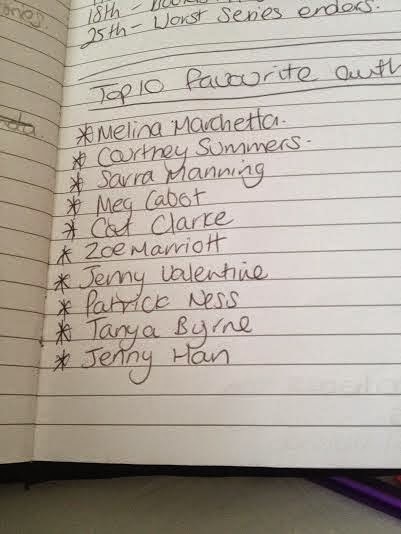 Top 10 Favourite Authors scheduled for Tuesday 21st April. Now I rarely sit down and churn out a post all in one go. Usually what will happen is that everything happens in stages. I'll log into Blogger, and create new posts. I'll give them appropriate titles and tags and schedule it. Around the same time I might have written out the list into my blogging notebook. At another time I might add that list of books (authors in this case) into the blog post. Then another day I might come along and work on adding the relevant images to the post. And again, at another time, I'll finish by adding in the text that blog post needs. Usually the aim of these non-review posts are for them to be filled with interesting and informative blog posts with plenty of images to break up the text. I do it in stages so that it's easier for me to fill a blog posts with lots of stuff but without it being too taxing. Reviews are slightly different but have fewer stages. I might still start by adding a new blog post, titling it and tagging it. But I'll probably add the cover image right from the start. Stage 2 might see me adding some rough notes for what the review will mention but usually when I'm at the note-taking stage I'll just soldier on and write out the review all in one go. That's how I blog, how do you blog? I'd love to hear from you! My blogging notebook is literally the heart of my blog, if I lost that notebook, I would seriously struggle to blog! All my ideas go into that blog, I transfer them from a note on my phone into my notebook so they're all in one place. I also draft a ton of my reviews in it so when I have a free evening I can sit and type up a bunch of them all at once until they're ready to be scheduled. I used to plan a monthly schedule, but I'm now a lot looser and just post what I want, when I want to, to try and keep things a bit more interesting for everyone!